Props to my best bud Amy for recommending this little miracle-worker. Max was so fussy as a newborn, and for the first few months of his life, his only naps (aside from in the car) were in this rocker (I tried and tried to get him cozy in a sling or other baby carrier for naps, but without much success). 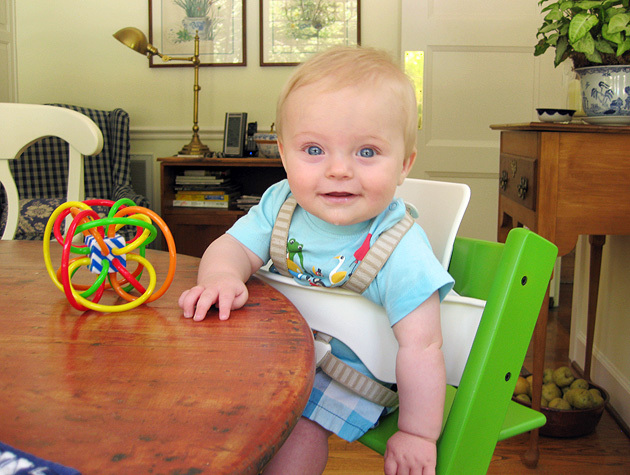 The Rock'n'Play is totally portable, so I often folded it right up and took it to dinner parties or on road trips. I loved that we could push it up next to the dinner table, too, so Max could be in his happy place and still be part of the action. We never bothered with a swing or bouncer, because this little rocker did it all! We considered co-sleeping, but ultimately decided it would be best for me and Ben's sanity to have our future baby sleep right next to me in our bedroom. 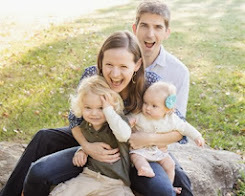 (We did try some nights of bringing Max into our bed; although it works great for lots of families, I don't think any of us slept on those nights - just wasn't the best choice for us!) Our room wasn't big enough to fit a pack'n'play next to the bed, so I found one of these classic bassinets with a rocking base on Craigslist. It was petite enough for our space and just the right height for me to reach Max from our platform bed. I loved hearing him breathing next to me and being able to reach over and soothe him or nurse him or rock him a little. But I still had my own space to sprawl out in bed! As an added bonus, the bassinet fits into any decor, AND it can easily slide around the house, so if Max fell asleep in it, I could scoot him to wherever I was. Max fit in this until he was about three months old (he was big, though - I'm sure some babies would last longer), and then we cleared out a corner of our room and moved his crib in with us. In our Calgary condo where Max was born, we never needed a monitor because (1) Max slept in our room until he was almost six months old, and (2) Our condo was tiny and we could hear everything from every room. 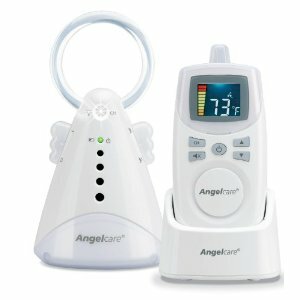 When we moved back to Nashville, we wanted the freedom to wander around our new backyard or a far room of the house while Max was napping, so I did lots of review-reading and finally settled on this Angelcare monitor. I'd heard from friends with the motion-sensor monitors that the sensors' false alarms were pretty heart-attack inducing (and since Max was six months old by the time we bought this, he was past the riskiest sleep phase for babies). We didn't feel we needed a video monitor either, so this straightforward choice has worked like a charm for us. It always gets good reception throughout our house and yard, and my all-time favorite feature? It's rechargeable! You just have to sit the receiver in the base to charge it up, so no fumbling around with or worrying about spare batteries. This monitor has been going strong for a little more than a year now. The seat and footrest are fully adjustable, so we simply lower them as Max gets bigger. He really likes having a footrest, and now that he's bigger, he loves being able to climb into the chair by himself. 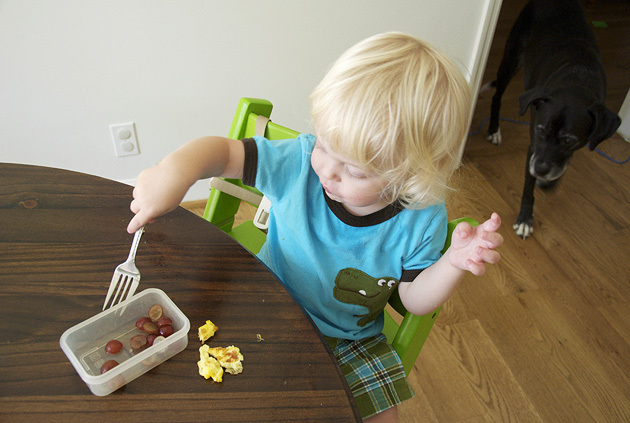 From the time Max first started eating, we didn't use a tray (although Stokke has started making a rather overpriced tray attachment). I had read that pulling baby right up to the table would help him feel more like a part of the family and encourage eating skills, so we just wipe off our table every night instead of a tray ;) Admittedly, we also have a cheap booster seat (with a tray) that fastens onto a kitchen chair. We use that for travel, eating outside or for the occasional extra messy meal! When Max was a year old and started walking on his own, I was thrilled! And then I realized that he was no longer content to sit around while I worked in the kitchen. He wanted to be part of the action. 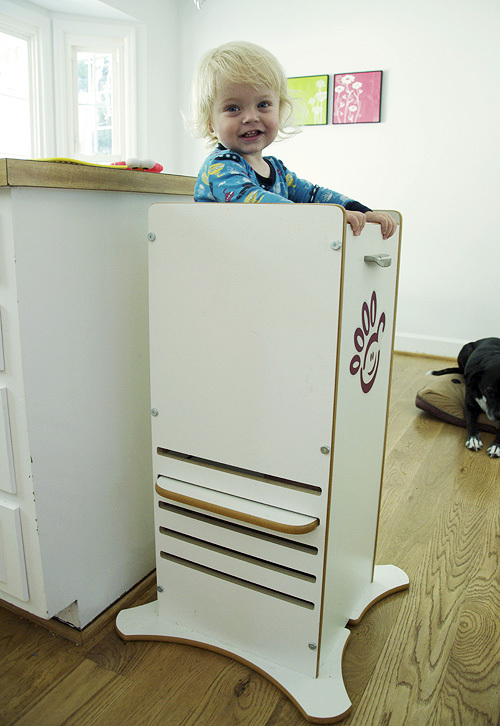 So I did some asking around and discovered that a few moms I knew had a kitchen stand for their little ones and loved it. I opted for the FunPod because it's the most compact version I could find, and it stows neatly in the corner of my dining room. I also liked that the sides were solid, unlike some models that were meant for kids to be able to climb in and out of. I began using the FunPod when Max was only a year old, so he was still wobbly, and I didn't want him slipping out of an open side. Also, the base is height-adjustable, so he'll be able to use it for years. Here's Max in his FunPod, helping me make granola! Here's the Ikea Gulliver crib in Max's very first nursery, back in Calgary! 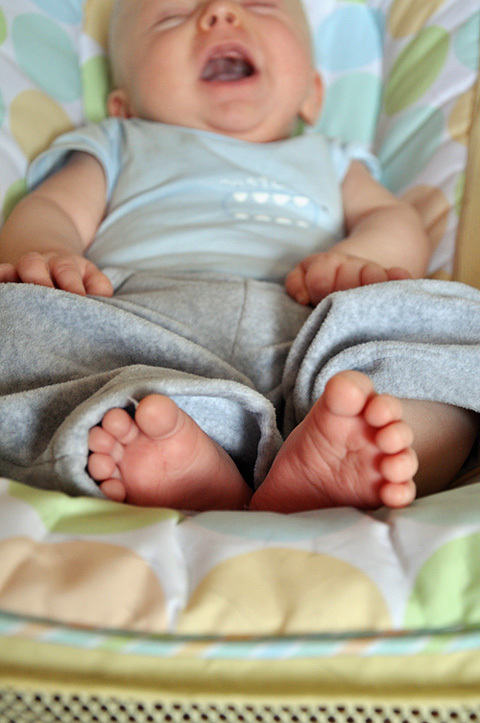 I decided a crib was not where I wanted to blow my budget, mostly because we were in a temporary home when I purchased it, and I didn't know if it would stay with us for the long haul. Well our Gulliver crib from Ikea HAS come with us from Canada back to Nashville, and it's held up perfectly. I'd buy it all over again. The price (currently $99) can't be beat for the style and durability. 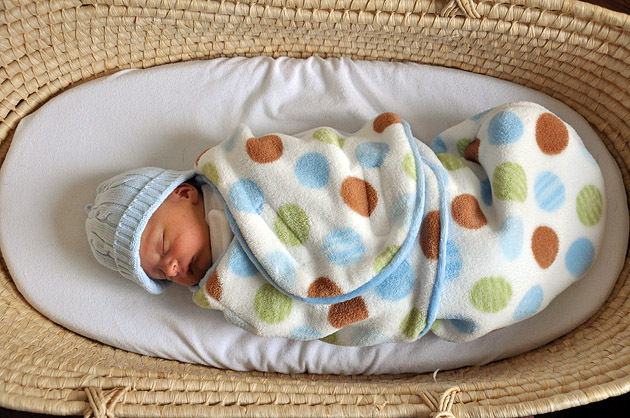 I also did tons of research into the safety, and this crib holds its own in that department as well, in addition to being more eco-friendly and non-toxic than some options. The Gulliver seems to match pretty much any decor, and it converts from a baby to toddler bed (which we'll be doing soon, ack!). There were a few runners-up for this list - things I love, but that aren't necessarily as universal or must-have items, so I won't elaborate (just send me a note or leave a comment if you want to know more about any of them!) They all are linked up if you're looking for more info! What are your favorites? Leave a comment and let me know!! Hello! Love the glider rocking chair in your nursery - it is the perfect size for mine. Can you share where you purchased? Hi Shavonne! I'm a little late, but it's actually just an Ikea Poang rocking chair. I've used it now in both of my kids' nurseries, it's great!